We broke the same bone. My recovery was a breeze, hers an ordeal. Why? Startups offering solutions to water problems, but are they feasible? Why run at all, instead of hitting the gym or picking up a sport? Water workouts provide a demanding full-body exercise as they provide resistance from all vectors and angles. Swimming is a great aerobics exercise for toning parts of the body that aren’t actively moving, and are now supporting you against the resistance of the water. These workouts are also more unique because they provide firm resistance without impact. Loosing balance while lifting weights, or practicing the wrong form during machine workouts can injure the body as opposed to rarely tumbling over in the pool. Kick set: Focus on improving your kick in the water. This is a great cardiovascular activity that enables weight loss from the belly and thigh areas. How to do it: Kick fast with floppy ankles and relaxed knees. Beginner’s level: 4 x 25 metres with a kickboard, keeping their face in the water and breathing out. 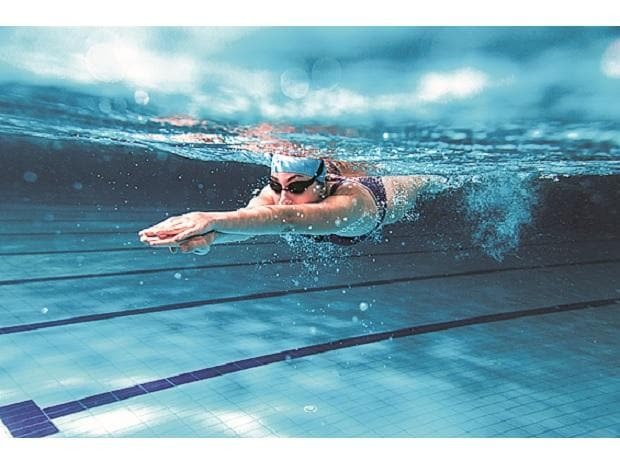 Intermediate: 8 x 25 mts- Freestyle, backstroke or breaststroke. Kick using a kickboard with your head up and arms over the board (free and breast). For backstroke, the board can be held over your stomach. Freestyle intervals: This is a great way to achieve a low- impact workout. Instead of swimming continuous laps that can tire you, try taking intervals between them. How to do it: Start with a smaller distance, then progress to repeats of 100 meters. Always use a sportswatch or timer to keep track and hydrate well. Advance: 8 x 100 metres for 3 minutes. Count the number of strokes, so you can keep them constant. Keep increasing the repetitions or decreasing the rest intervals as you get fitter. The same can be done with backstroke or breaststroke. How to do it: Stand in chest-level water, and face the other end of the pool. Walk with a steady pace to the far end and continue to take laps back and forth while maintaining a brisk speed.